SA Army soldiers on parade. The national defence force’s ongoing contribution to job creation – the military skills development system (MSDS) – this year shows a slight improvement in the number of young people who made selection and are now doing basic military training (BMT). Figures supplied by the SA National Defence Force’s (SANDF) Directorate: Corporate Communications show the Army was allocated 1 172 recruits who reported for service at the Infantry School in Oudtshoorn earlier this month with a further 245 recruits making the grade for entry into the SA Air Force (SAAF). The SAAF recruits reported for duty at AFB Zwartkop in Centurion. defenceWeb previously reported the SA Navy had taken 228 recruits “aboard” at SAS Saldanha. The SA Military Health Service (SAMHS) was apparently not allocated any MSDS recruits for the current two year training cycle. Last year 150 MSDS recruits entered the military health service. This year’s intake of 1 645 is slightly up on the 2018 figure of 1 552 but less than the previous year’s 2 066. On successful completion of basic military training the 2019 intake will undergo further training in musterings ranging from fire and emergency services through to chefs and other support functions in the SA National Defence Force (SANDF). 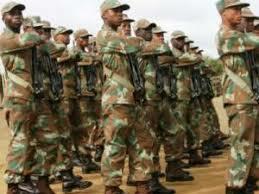 Combat musterings for further training in the landward (SA Army) and maritime (SA Navy) services are also possible. MSDS recruits spend two years in uniform and while this service is no guarantee of further – permanent or semi-permanent – employment in the South African military, there are instances where those who have completed the two years voluntary service are offered short term employment contracts in the national defence force’s full-time component. The Reserve Force is generally where MSDs who find themselves not accepted by the full-time force go to apply and utilise their military skills. The Navy is currently seeking applications for the 2020 MSDS intake and makes specific mention of posts in the combat, engineering, technical and support fields as well as the maritime reaction squadron (MRS). The application form can be obtained from any SANDF recruitment office or downloaded from the Navy website (http://www.navy.mil.za/forecastle/MSDS2020-Navy-Ad-300-221%20-%20Rev2%20(1).pdf). To qualify for the MSDS programme, applicants need to be South African citizens between 18 and 22 years old (graduates up to the age of 26 years); be currently busy with the National Senior Certificate (Grade 12) or have completed it; not be area bound; have no record of a criminal offence; be preferably single; comply with medical fitness requirements for appointment in the South African National Defence Force; and be prepared to do Basic Military Training, Functional Training and to serve in uniform. In the first year of voluntary service, members can expect to receive basic military training and functional training; corps specific training; participation in practical military exercises; combat ready training exercises and selection of junior leaders. During the second year of training, junior leaders (Officers) receive leader group corps training. Members also undergo young officers’ formative training and officers are selected to study at the Military Academy. There is also a focus on the utilisation and deployment of Military Skills Development System troops.